Time is the most valuable asset we have in our possession. With the May update, we’re providing you with some exciting tools to help minimize the time and clicks spent on different actions. Without wasting another moment, let’s take a look at what’s new. Sometimes the task is just too big to handle it alone. 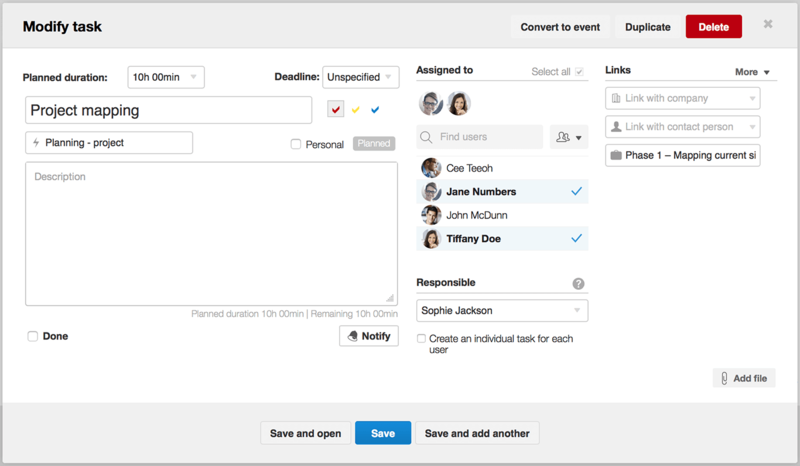 Well, from now on you can split a task between multiple team members – this way the workload is divided into manageable pieces among the team, and it’s easy for each of the doers to log their work-time under the task. How does it work? Go to Settings > Work and projects > Calendar and tasks to activate the feature. When creating a new task or modifying an existing one, just assign the task to multiple people instead of one. This way a proportion of the task is added to the task list of each assignee and, in addition, they’re automatically notified. So far you’ve been able to add duplicates of the same task for multiple users. You can also keep using this option, just tick the checkbox Create an individual task for each user before saving the task. Get an exact overview of the task’s progress – what each team member has been doing and how much time has been put in to finish the task. Note! This feature is available in Scoro Premium and Ultimate packages. Instead of creating multiple invoices from different quotes, bills, and other documents, and send each of them to a customer separately, you can now combine multiple sales and purchase documents into one joint invoice. It’s actually very simple. In different list views (for quotes, orders, bills and purchase orders) you can just select the documents you would like to combine and click the button Create Invoice. When the button is clicked, the view for creating an invoice opens up with all the products/services from the selected documents already added to the invoice. In addition, Scoro will automatically fill in the data (such as contact information) on the invoice that is common for all the selected documents. No need to spend time on any manual work. Note! To be able to create a combined invoice, the selected documents need to have the same currency and/or overall discount. No more navigating from a quote to the projects list to create a new project from scratch and add the relevant details manually when a client has confirmed your offer. You can now create a project with one click straight from the quote. We’ve added an option Create project to the quote detailed view that is displayed if the quote hasn’t already been linked to a project. Click on the button Use data on the quote to … and select the option to create a project – you’re taken to the project modify view where the relevant data is already filled in for you. You can still add or change the details if needed. The sum of the services (with units such as “hour” and “day”) on the quote will be used to calculate the estimated duration of the project. Plus, both income and cost from the quote are taken into account when comparing the budgeted data to actual results and filling the project summary table. Manage your workflow (from start to finish) with fewer clicks and use the time saved to take a well-earned coffee break. It’s quite common that some project-related expenses (in addition to the actual work done) need to be paid for by the customer. 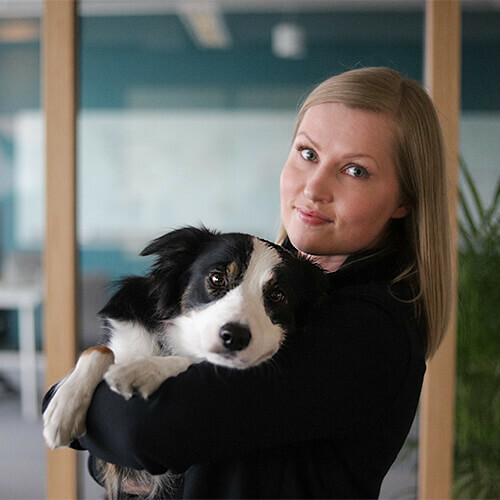 Well, in the same way, you can invoice your customer for your work, you can now easily charge them for the bills you’ve added to your Scoro site. In the work report, a user can create an invoice based on time entries (tasks or events) with related bills (as long as the time entries are linked to a project and the bills under it are still unsettled). To create an invoice from these bills, the This bill is chargeable to the client checkbox has to be ticked. We’ve also added icons to the related bills section in the project, contact and purchase order detailed view that indicate whether the bill that’s marked as chargeable to the client has already been invoiced or not. With a few simple steps, the costs you’ve been charged are recovered from your customer. There’s now a country filter in the task list view. If a certain company is linked to a task, the country of the company is taken into account when filtering out the relevant results. If a contact person is linked to the task, but the company isn’t, the contact person’s country is taken into account. This filter is also available when creating a bookmark from a list view or through a dashlet on a dashboard. Country can be added to the list as a column, just activate it under the View options. When linking an event or a task with a project and then starting to link a sales document that is already linked to the aforementioned project, the related sales documents are now displayed on top of the list. This way it’s easy to find and link your activities to the right deals. 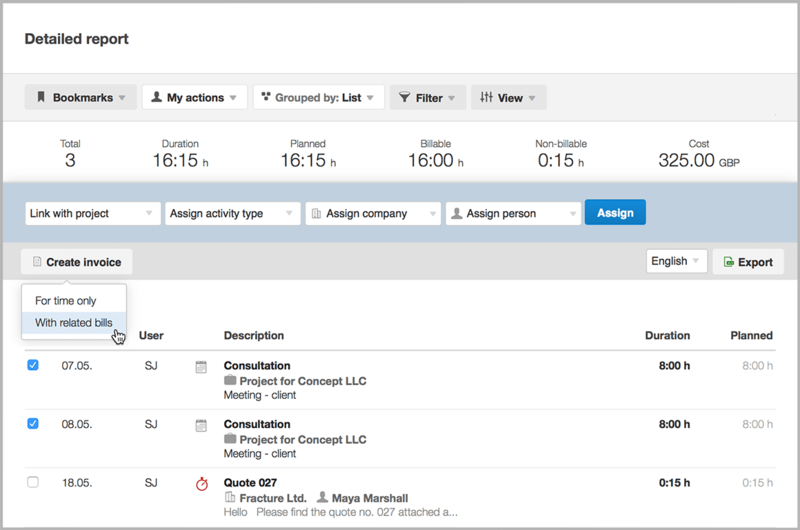 Now, instead of having to open the task to see its contents, when hovering over the task icon of a task in the left-hand column in the Planner, the data of the task is displayed as a preview. The tasks in the task list are nicely sorted by the option you’ve selected from the filters. The time entries under the tasks, on the other hand, didn’t follow the same rules. We’ve improved this logic so that the time entries under each task are arranged by the same option you’ve chosen for tasks. Note! This time-entry sub-sorting is applied only if the list is sorted by activity types or users. In other cases, the time entries are arranged by dates. We’ve improved the validation process for contacts. Now, when site users enter an email address on a contact card, the system will check whether the format of the address is correct. If the entered email address does not pass validation, the system will notify the user to check and modify the email address. When sending a sales or purchase document from Scoro to a client, a sent icon (a tick) with today’s date is automatically added next to the document in the relevant list view. The same happens, when manually marking the document as sent. In addition, you can now hover over the sent icon to see the date sent. As we’re making sales and purchase documents’ detailed views cleaner and easier to use, we’ve grouped different actions under one button. Just click Use data on the document to … and select the suitable option from the drop-down. In the quote and order view, you can now choose whether to transfer all details or summarize line items. We’ve added more data to the sales and purchase documents’ preview window. If you are using the Additional quantity option in your site, you can now also see this data in the preview window (when hovering on an invoice icon in the invoices list, for example). You can now mark notifications as unread in Scoro and come back to them, when the time is right. 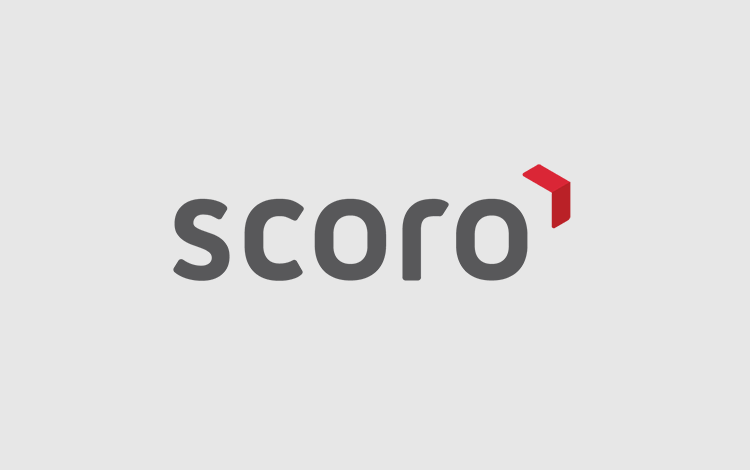 We’ve made over 200 visual improvements all over Scoro, from icons and colors to adding more space and modernizing the look of Scoro. We’ve also rearranged some filters and buttons in different views in Scoro to make them more consistent and cleaner. All system filters (except the user filter) are now grouped under the Filter button in all filterable views in Scoro. The bookmarks button is now located next to the filters. The address filters in the Contacts list are now dropdowns. Just click the Filter button to display all available filters. Read on: What If Companies Managed Time as Carefully as They Manage Money? We’ve improved the imports view and made it more logical for you to use. In addition, some new fields have been added among the supported ones. This is just one small step in the long list of improvements to come in the imports module. From now on, during the coming version updates, we’re also renewing different pages under Settings in Scoro. This time we’ve refined the time-billing settings page. We’re also adding some tips with links to related settings on each renewed setting page, so it’s easy to set up other features that might be helpful in your everyday work. As of now, site administrators can allow site users to access and activate integrations on their site. To activate this option, click on Allow all users to access this integration under each integration. The integrations that have this setting enabled will become available for all users of the site.